This West African Black-Eyed Pea Salad (or Saladu Nebbe in Senegalese) is bright and fresh with a bit of a kick. 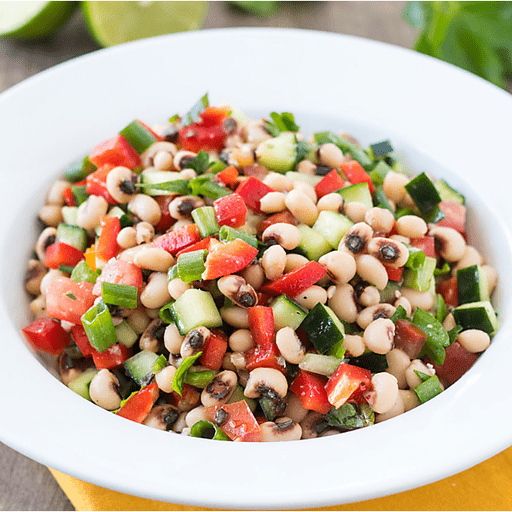 Featuring black-eyed peas, an affordable source of plant-based protein, this yummy salad gets better over time. Serve with traditional grilled fish or a whole grain, like brown rice, for a complete plant-based protein meal. 1. In a large bowl, whisk together lime juice, parsley and canola oil into a smooth dressing. 1. To dressing, add black-eyed peas, green onions, bell pepper, tomato, cucumber and serrano pepper. Stir to mix. 1. Add salt and pepper to taste. Refrigerate for at least 1 hour or up to overnight to allow flavors to meld. Serve chilled. Per Serving: Calories 140, Total Fat 6g (Saturated 0g, Trans 0g), Cholesterol 0mg, Sodium 290mg, Total Carbohydrate 18g (Dietary Fiber 4g, Sugars 2g), Protein 4g, Vitamin A 20%, Vitamin C 60%, Calcium 4%, Iron 10% *Nutritional values are an approximation. Actual nutritional values may vary due to preparation techniques, variations related to suppliers, regional and seasonal differences, or rounding.